Sometimes, despite all the hard work and effort you put into work, you get to the end (or beginning) of a paycheck cycle and realize I have no money! Or maybe you’ve hit a bad patch of bills and costs and you find yourself with just a few bucks left in your checking account. Dealing with a no-money situation can be stressful, even if it’s temporary. 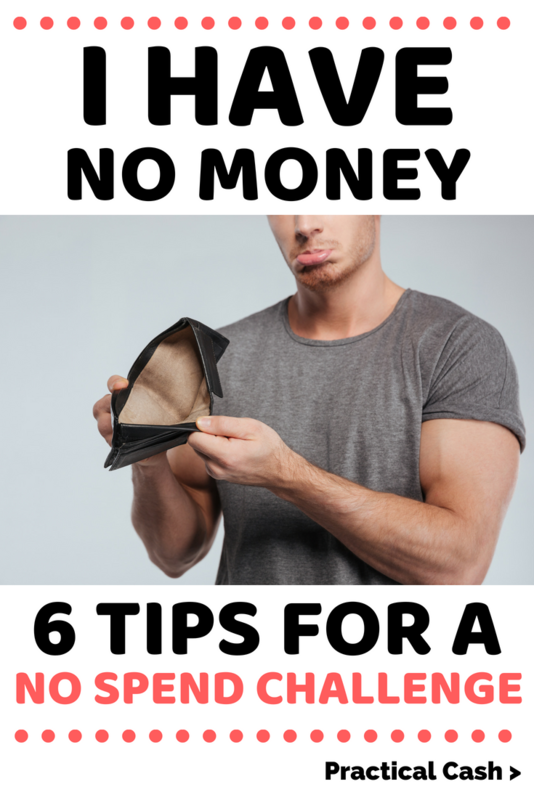 Being forced into having no money – maybe your boss is late with your payment, maybe you had a huge car repair you weren’t anticipating – can be incredibly frustrating. What do you do when say I have no money? Do you have any tips or tactics you use to stick to a no spend challenge? But there is one thing you can control when you have no money – your expenses. 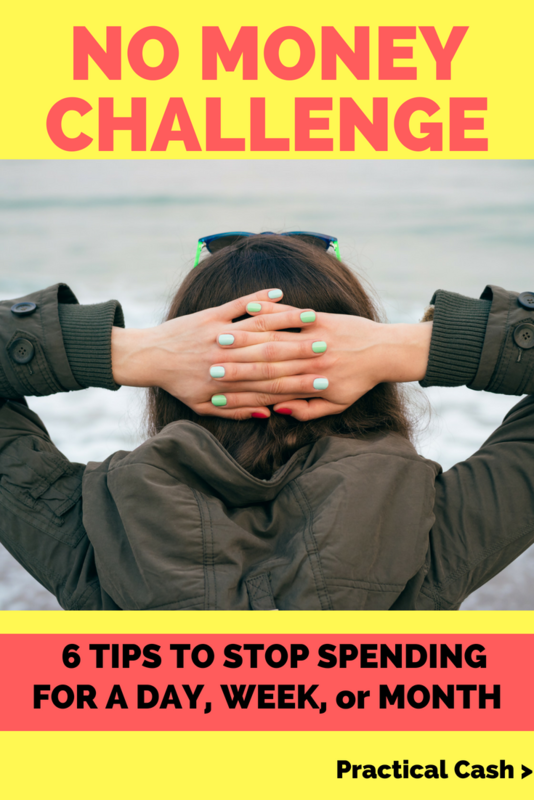 One way to control your expenses quickly and drastically is to do a no spend money challenge. You can do a day, week, or month (or a year!). The less money you’re spending, the more easily you can deal with your I have no money situation. What’s a no spend money challenge? In a no spend money challenge, you aim to spend no money for a day, week, month, year or however long you determine. You might go extreme and curtail any and all expenses. Or you might say that you’ll avoid any spending beyond your normal bills and food and gas. How long you do your no spend challenge is up to you and dependent on how severe your financial situation is. But it is a way to take control when you say I have no money. Find any and all sources of money I have lying around unutilized. So I gather any extra change from purses or couch cushions. Round up any gift cards that I haven’t used – gas, grocery, online, or entertainment. I could use these if necessary instead of spending other funds. Use up any health and beauty items I already have instead of purchasing more. If I run out of my favorite lotion, for example, I use up any lotion I have already or even coconut oil instead of buying more. Substitute reusable products instead of disposables if I run out (ie, old t-shirt as a rag instead of paper towels, etc.) – this is better for the environment too! It’s easy to spend extra money when you’re bored or overwhelmed. You might have a free afternoon and hit up the mall. After a soft pretzel, drink, and a new outfit, you’re now $100 poorer. How many times do you spend money just to keep boredom at bay? The way to avoid spending during a no-spend day, week, or month is to proactively fill your time BEFORE you have a chance to spend or get bored. Craft a master list of all of the projects around your house that cost nothing – but that you never get around to doing. Now’s the time to do them. List out all the meals you can make with what you already have in your fridge or freezer and get started meal prepping them. Declutter your closets and garage – you might even find some stuff you can sell to MAKE money during this no spend money challenge. Here are some free activities I do when I have no money that helps keep myself busy. Sort all bills and paperwork. Shred unneeded papers. Write detailed to-do lists for projects at home or work. List items on Ebay or clothes and shoes on Poshmark that I no longer wear. Organize all digital photos and make sure everything is being backed up to the cloud in case of computer failure. Defrag hard drive, run virus scans, and purge old computer files and photos. Batch cook meals from meat and veggies I already have in the house. I download free ebooks, audiobooks, and shows from my library’s Hoopla and Overdrive collections. I try free trials of services that might help me save money. One of my favorite money saving services, for example, is Amazon Prime. I actually find I spend less money by having Prime! Since I live a distance from stores, I can simply put my needs in my Amazon cart and it costs a lot less to have them delivered than it does to use the gas to get to the store in my car. It’s a true time saver and life saver. Even if you’re cash strapped you can start an investment account, and during a money challenge is the perfect time! With as little as $0.01 you can use an easy app to get started investing with an app called Acorns. Once your money challenge is over, every time you buy something, your change will automatically be invested for you. So when you buy something for $0.97, for example, the Acorns app could put $0.03 in your investment account for you. Every time you leave the house, you are prone to breaking your no spend challenge. If I have no money, I stay home more than normal because it’s a simple way to avoid spending. Using your car ultimately uses gas, even if you don’t spend anything else beyond that. Of course, if you work out of the home, you can’t completely stick to this one. But you could aim to go straight to work and straight home, with no stops off at the coffee shop or the bookstore where you might be tempted to spend. For social activities, invite friends over – if everyone brings a dish, it won’t hurt your money challenge and you’ll have free entertainment. Having no money can be a situation that defeats you, or it can be a situation that helps turn you into a better money manager. When I have no money, it’s typically because I took on too much debt or too many expenses or because I failed to save enough money. Sometimes I may have no money because I’ve become complacent about my career or income. So I use the extra time I have from staying home to turn my money woes into an income generating opportunity. Reach out to anyone I know who has freelance work I could take on. Start a new side hustle to make extra money. Brainstorm ways I could earn extra income – by mowing lawns, cooking meals, or babysitting. Call my insurance and utility providers to see if there are any promotions or ways to save on my bill. Cut off any subscriptions to magazines, streaming services, or other non-essentials. I’m a fan of the gold star. One thing I do when I have no money and want to stick to my no spend money challenge is to print a free calendar for the month and affix a gold star for every day I avoid spending. I like to set a no spend goal – like 5 no spend days in a week or 22 no spend days in a month. You might prefer a big red X through each no spend day. However you choose to note it, the no spend calendar helps you celebrate your everyday successes and self-discipline. Face it – it can get discouraging when you have no money. You have to embrace your progress toward better finances!